Certain browsers and email applications won't recognize the Clarify registration URL (for example, Gmail and Google Chrome). If you run into this issue you will need register manually. Make sure that you use the name included with your license key. If your name doesn't match the one used to generate the key then you will receive an error. Prev: Am I eligible for a free upgrade to Clarify 2? 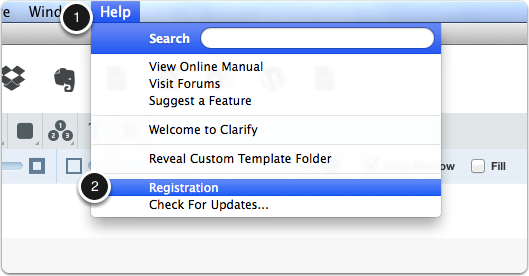 Next: What are the differences between the version of Clarify available from your website and the Mac App Store version? I have un-installed clarify and installed it on a new machine. @Anthony - You are probably trying to register Clarify 1 with a Clarify license key. Make sure you download Clarify 2 from our site and that you include the "clarify2win-" portion of the license key.